More than ever, Business to Business (B2B) marketing requires one-on-one relationships. Making real, human connections with your business prospects to forge relationships that open doors to social selling. Being effective within social media to achieve this all important task is paramount to short and long-term success. One of the key social networks for effectively forging B2B relationships is LinkedIn. Unfortunately, as the most formal business social network, higher level connections are sometimes not as open to connecting with people they don’t know. All too often, the decision makers many B2B companies want to connect with, are also bombarded by contacts that are pitching them and sending them spam, without first making the all important relationship connection. This can lead to executives denying or ignoring friend requests. So what is an effective way to improve your LinkedIn connections? We have found that if you leverage the most informal social platform WITH the most formal one, amazing things can happen. Twitter is the most informal social network there is and you don’t have to already be a “friend” to engage with someone. 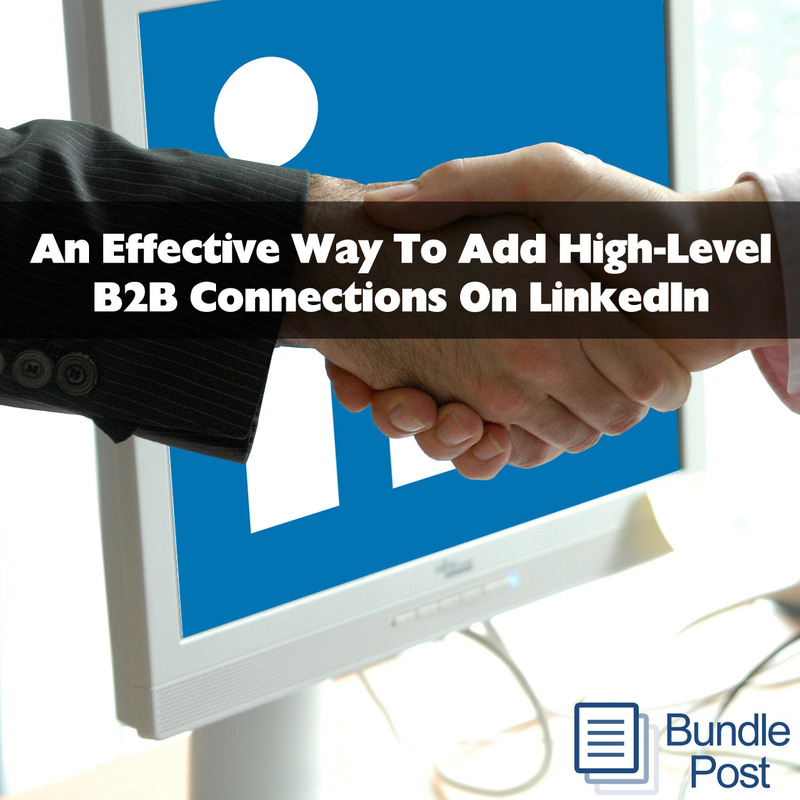 When you want to build a relationships with a B2B connection on LinkedIn there are steps you can follow to do this very effectively. 1) Most LinkedIn users display their Twitter account name if they also have a Twitter account. Go connect with them on Twitter first. 2) Spend a few weeks commenting, retweeting and getting into conversations with the person on Twitter. Start slow and build the daily amount up to about 3-4 daily interactions over at least a two-week period. 3) Build rapport and name recognition with the person without coming across needy or as a stalker. 4) Once you have invested a few weeks in building a relationship, then friend request on them on LinkedIn with a personal message that references your conversations on LinkedIn. Ok You’re Connected, What Now? When the connection on LinkedIn is accepted, don’t make the newbie mistake of sending your sales pitch or requesting a call or meeting. You’re not done yet. You will want to continue the escalated engagement on Twitter, and add the same slowly ramped up activity of liking, sharing their content and commenting on the posts of your new connection for a few more weeks. The goal here is to build a deeper rapport with your connection that focuses on conversation around common interests. Only when you have accomplished that do you bring up a potential discussion out of the social graph. Providing that your contact is at least fairly active on social media, this process is highly effective. People that would never respond to you or accept a friend request on LinkedIn will often follow, respond and engage with you on the far more informal Twitter. Putting in the time and effort using this process breaks down the barriers that they have within the formal LinkedIn ecosystem, making them far more receptive to an add. Remember that Business to Business connections are human. People often do business with people they feel they know and like. Today, business IS personal and not the cold fiscal only decision-making process of earlier times. When connections become relationships through conversation and mutual interests, those relationships become friendships and potential customers. If you take a different view of LinkedIn as part of the overall social media flow, rather than a prospecting tool, your B2B efforts will be rewarded with incredible relationships, sales and customers.